​﻿We would like to express our deep gratitude to Chuck Wild for the assistance his music provides to our work. All of our channeling is done with the assistance of Chuck Wild's Liquid Mind music for relaxation and meditation.This channeling was done using the "Dream: A Liquid Mind Experience" album. 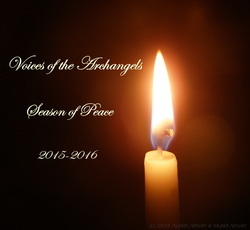 “Yes, then, it is I, the Archangel Raphael, and I would speak to you at this time of the gift of Joy, especially as the gift of Joy pertains to Peace for this is the Season of Peace celebration that we are discussing here. And, messages are being shared to help you as you seek to find you way into a Life of greater Peace. And, so I say to you, consider Joy for a moment and how it fits with the concept of Peace. is felt with the Heart. True Joy is a feeling. It is not a sensory experience. It is something that comes from within you. It is something that only comes from your Truth. True Joy is grossly overstated as it is truly, in its greatest sense, very subtle. It comes in the form of happiness. It comes in the form of contentment. When you feel content that is Joy. But, Joy without contentment, Joy with satisfaction, is not true Joy. And, there is much, much, much of this in your world, and it is an Illusion. What is the Illusion of Joy? Hmmmmm. That is a difficult one to call, because Joy is such a broad spectrum of experience for so many different people that it is hard to say what the Illusion of it is. But, I can tell you this: The way you can tell whether you are experiencing true Joy or not is by measuring it against your sense of satisfaction, contentment, the Peace you feel inside. When you are experiencing Joy, does it leave you feeling Peaceful inside? then perhaps you have truly experienced Joy. in humanity, in the world, and in your own lives, where changes are running rampant. And, they are in front of you at every hour of the day and every turn you take. and you will be following the path of Love. And, if you follow the path of Joy and Love, you are also following the path of Peace. you must make a choice which leaves you feeling content. The one which leaves you feeling satisfied, as if you don't need to think about it anymore. You don't need to research it, investigate it, analyze it and so on. And, when you feel that sense of Peace inside, then you know that you have made the correct choice. Now, your world is also at a crossroads where you are either going to choose to live in Peace or you are going to choose to not. And, your world is becoming greatly segregated. What is going to bring Joy to each side? You are going to see great separation in that as well, and you will have to look at Truth. in causing harm to others. that they have done wrong. They know that to cause harm to another is wrong. is perhaps not welcome, nor highly thought of. But, I say to you this: If you would experience your greatest Joys in Life, if you would experience Joy in the scope of Peace, if you would experience Peace itself, and Love as well, you must Forgive. You must stop the cycle of hurt and harm and violence somewhere. then how will it ever stop? if someone does not begin it? And, that someone can be you. And, that someone should be you. the greater Forgiveness reigns in the world. And, Forgiveness is a very powerful tool of Love. You must Understand that your Joy is not only a personal thing. It is not only a family thing. It's not just something shared between friends, and co-workers, and neighbors, and members of a community, or a state, or a nation, or so on. Joy, as has been spoken, travels through the nervous system. And, it connects with each and every one of you. And, they want Forgiveness at another level. At another level, they want to give Forgiveness. And, so you can lift the burdens from their Hearts and help them see the Truth of Joy if you will Forgive them. Send Forgiveness. You have the power by Oneness to do this – the Laws of Oneness. you have done in your own. No one is perfect. No one is without blame. Everyone needs Forgiveness, and everyone needs to give Forgiveness. That is a beauty of Love, especially unconditional Love. And, when you think of unconditional, you should also think of unconditional Forgiveness. And, so, if you wish to experience your greatest Joy in Life, you must begin by finding your own Truth and finding your own Peace. Find that sense of satisfaction and contentment. But, I say to you: If you wish to find Joy in a world, in your world, take the next step. Go a little farther. for Forgiveness can truly work miracles. Find your Joy without condition. And, do not be caught up in the flashing lights and neon signs that say, “Love is excitement”, for it is not. Joy is not excitement, neither is Truth or Peace, and so on. Once you find the Illumination of your own Joy, and you Understand what it is that causes it, you will find it is the simple things in Life. It is the touch of a child's hand on your cheek. The kiss and 'I Love you' before bed. It is watching the bird sit upon the branch and sing its beautiful song. Dewdrops in the morning. Raindrops in the evening. A snowflake here or there. Perhaps it is a wind that whispers someone's name in your ear and in your Heart. These are the little things that really matter in Life. These are the things that stay with you forever, for you never forget them. So, foster those feelings within yourself, and you will find your Joy. Share the Illumination of it. Find it again – in Truth. Find it in everything you do and share it. Share it. Share it. Always, always share your Joy. These are difficult times for many. And, I wish that I could wave a magic wand over your heads and make you all feel nothing but Joy. But, you must come to Understand that Joy is a process of evolution. It truly is a process of evolution. the more you will find your own Joy – the Truth of your Joy, the Illumination of it. And, as you better Understand your own Joy and what makes you feel Joy and happiness and contentment, and so on, then you will know how to bring more of it into your Life. And you will know how to share it and help others find their own Joy. Share it with others, and help them find their Joy. I will be with you always, and any time you need assistance with finding your Joy, you may call upon me. That is all for now, my beloved children.